Is there any possibility in sharepoint to create single column which will have both single line of text and choice as column type? 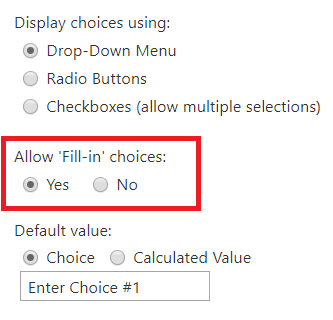 Yes, if you enable 'Fill-in' option in the column settings. You can define options for choice field and user is also able to "select" own value by typing it. You can create a new column with type as Choice and choose Allow 'Fill-in' choices option to Yes in column settings. Select any choice from the Dropdown(Choice given in column settings). Input Single Line of Text. This text will not be available under the choices dropdown but, still you can enter any free text in it. Not the answer you're looking for? Browse other questions tagged sharepoint-designer column choice-field single-line-of-text or ask your own question.